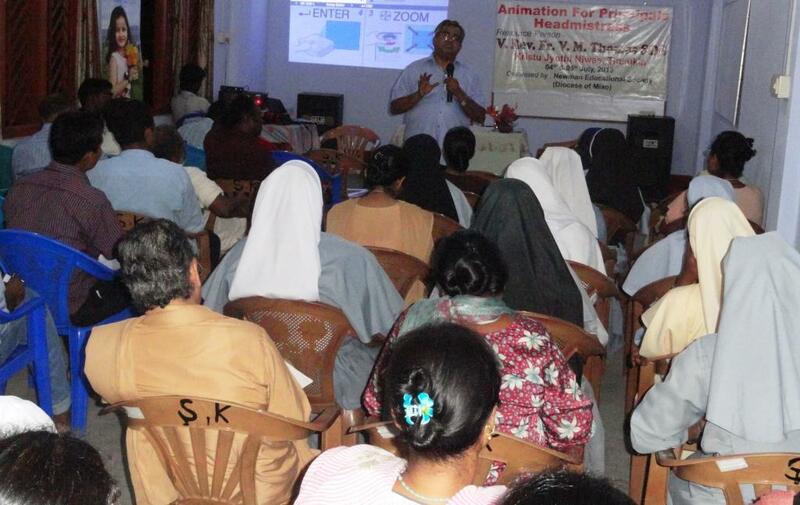 5th July, Tinsukia: An Animation for the Principals and Headmistress in all the Schools in the Diocese of Miao was organized by the Educational Commission of the Diocese on 5th and 6th July 2013 in Light House, Tinsukia. Rev. Fr. V. M. Thomas SDB, the Provincial of Guwahati Salesian Province animated some 46 participants from 22 schools across the Diocese. He focussed on the need for attitudinal change. Speaking to the participants, he said, “Life is like a tread-mill. If you wish to stay in the place, you need to keep running. It is necessary to update ourselves to meet the challenges.” He also challenged the participants to be disciples and not admirers of Christ, to be transformers and not passive agents. Quoting the examples of Jesus, the best teacher who had a vision and who inspired others to carry on the mission. The participants at the end of the two-days of animation, went back inspired to saddle their dreams to attempt great things for God. The Education Commission is extremely grateful to Bishop George for providing such a golden oppertunity to the participants. “It is so meaningful and relevant to have such a resourceful animation programme at the beginning of the academic year, as it would help us to become better teachers to help our students become ready to face the existing challenges in the society,” said Sr. Tiny, the Headmistress from Newman School, Neotan.